William's third birthday party was so fun. Exhausting and I wonder why I have to go so "over the top" for a party that he probably won't remember . . . but really fun. David and I were so tired that night and I asked him if it was worth it. He thought so and it seemed that Will had a wonderful time though so I'd say it was. I'm so thankful to my mom for helping me so much over the last few days and to my in-laws for coming in at the eleventh hour and helping set up and clean up. I have awesome family. Obviously, since Will is obsessed with dogs, I thought that the theme had to be dogs so that's where I started. David had this adorable idea to build a dog house for the kids to play in. Will and his friends aren't exactly at an age where they want to play games and the dog house was a hit. We put some kid chairs and a table with stuffed doggies in there and the kids loved to run in and out of it. and we served some "toilet water" to drink. I also made puppy chow (or muddy buddies) and put out some Scottie dogs and "dog treats" (pretzel sticks with mini marshmallows at the end, dipped in melted white chocolate). My super artistic mother-in-law even drew puppy dog faces on the balloons that we tied to the gate to let people know to come in the back yard. The kids loved taking them home. Can you believe she just free-handed these faces? Will was not in the mood to stand still for a photo op because he was so excited for his party. This is the best picture I got. By the time his friends got here he was running around and squealing with delight. Seeing him so happy made all the hard work worth it. I had planned on making a big chocolate cake for Will for his birthday because every time I asked him what he wanted for his birthday the only thing he would say was, "Choc-oh-late" and later he moved onto "Choc-oh-late cake". I'm so proud. So, obviously chocolate cake had to be on the menu. Instead of torturing myself with making a cake big enough to feed 30 people I just headed to Costco and bought one of their amazing chocolate cakes and it was more than enough. When everyone started singing Happy Birthday, Will plugged his ears. I think he thought the candles were going to explode or something. Ha! Then he got into it and it was really cute. And I let him lick the candles clean because it was his birthday and all. I don't know about you but in my family, you got to lick the frosting off the candles when it was your birthday. The family picture that wasn't very great but at least we got one! My mom helped William open his gifts (he got so many!) and he was thrilled with each one. It was so cute to see how after he opened each present, he seemed like he was perfectly content with what he had. He got pretty spoiled but he had good manners and thanked everyone. I'm so proud of my sweet William. Thanks again, that was so much fun! Sorry about the crappy pictures... I wish I had my camera and flash since it was getting dark. ;( Yours look great though! No! Thanks for taking the pictures! The lighting was bad and I wish Will had been better at smiling for the camera but its good enough. So glad you guys came! omg....everything looks so cute. Happy Birthday William. Happy Anniversary Elizabeth & David. What a cute idea and great execution of the cute idea. Happy birthday, Will! He is such a doll. Everything was so cute! What great ideas! I am blown away by your parties! you've got some mad skillz, if i do say so myself! the toilet water cracked me up! and the hot dog toppings looked so good. everything was just awesome. jaimey said it was lots of fun, too. hi! such a cute party!! we are doing a puppy party for our 2 year old this summer (we also live in sd!!). wondering where you got the cute invite and coordinating paper/printables? They are PERFECT! thanks! This party is too cute! 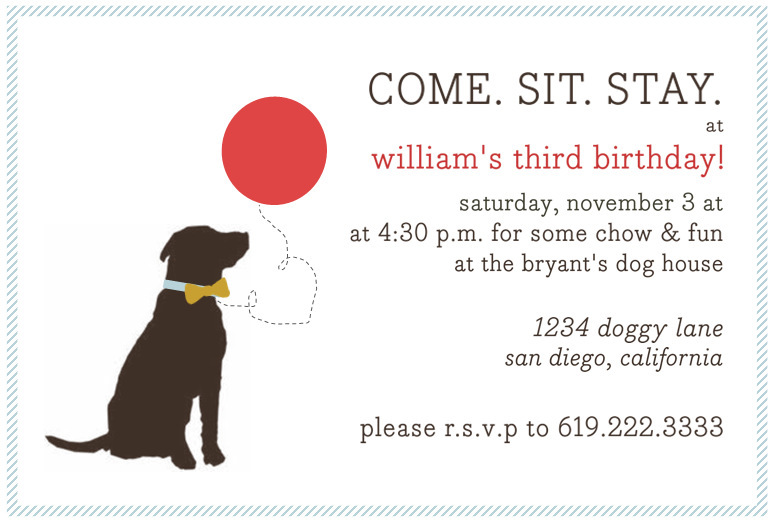 I'm working on a dog party for my own son who is turning three :) Where sis you get your invitations and food labels? They are exactly what I am looking for! Oh, found you through pinterest of course :) Thanks so much!! Fabulous party... stealing a lot of your ideas. Do you know the dimensions of the dog house? Any more info. on building it?